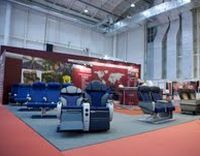 Aircraft Interiors Expo 2012 opened its doors on 27 March in Hamburg with more than 500 exhibitors from 30 countries participating – and a record amount of exhibition space taken by industry. The day before it was preceded by the first ever Aircraft Interiors Expo and World Travel Catering & Onboard Services Expo conference. More than 250 delegates packed into the Hamburg Messe to hear leading experts from the operator community, manufacturers, interiors suppliers and the consultancy sector give their views on the hot issues of today. One thing was very clear. To compete successfully operators will have to tailor their offerings ever more closely to the individual needs of their customers. To achieve this they need to develop their usage of new technology in a spectrum of areas, from e-techniques to speed up boarding to obtaining customer feedback from social media. 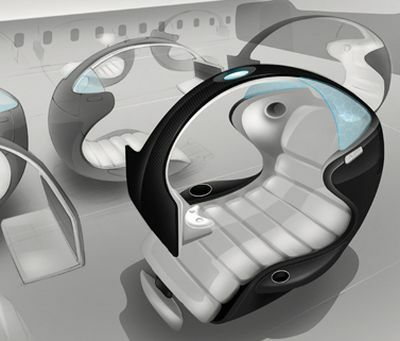 In between this comes a raft of potential advances in areas such as in-flight entertainment (IFE) and communication. Notwithstanding the recent global economic downturn the conference mood was decidedly upbeat, with mention of healthy order books for Airbus and Boeing and the vigorous growth of the emerging markets, particularly the Asia Pacific region. However, airlines have to fight for customers. Jeremy White, Head of Transport at Seymourpowell, explained the crucial role of data gathering in tailoring the offering to passengers’ specific needs, gaining information on their tastes in areas such as music and food. Personalisation could even be extended to identifying passengers with health concerns who could receive appropriate levels of attention from the cabin crew. Free wi-fi is a key enabler in gathering passenger information and White suggested that airlines could collaborate with brands to fund the connectivity. Customers can be presented with too much choice, leading to anxiety. Raymond Kollau, Founder and Trend Analyst at Airlinetrends.com, described how Air New Zealand had made life simpler for passengers on short haul routes by offering four easily understandable packages, ranging from ‘seat only’ through ‘seat and bag’ to the all-inclusive ‘deluxe’. Kollau also explained that airlines had to meet the challenge of the increasing geographical diversity of the passenger mix, stating that Emirates had cabin crew from 130 different nations. Sven Achilles, Vice President and General Manager, B/E Aerospace, noted that passenger numbers are doubling every 15 years. Competition abounds, with the advance of the alliances as well as airlines with strong market bases, such as Emirates, Etihad and Qatar. Airlines have to distinguish themselves from their competitors. One way was to install new products in the cabin but it was just as important to look at outside areas, such as the start point when the customer starts to think about buying a ticket. Making the point, Arnaud Masson, Head of Onboard Services at Eurostar, said that his company carried the passenger equivalent of 72 jumbo jets every day between London and Paris. Eurostar only offers two main destinations and passenger experience played a key role. The techniques employed by Eurostar included offering Business Class travellers a menu based on French cuisine for departures from Paris and an English focused menu for journeys starting in London. A recent notable success was a pizza that gave off a delicious aroma reminiscent of an authentic pizzeria. The show is firmly established as a premier platform for launching new products and this year was no exception. B/E Aerospace demonstrated its Angled Oasis Super First Class Suite, which enables passengers to use controlled sliding screens to achieve a high level of privacy, while the seat can be elongated into a long, fully flat, horizontal bed. Pitch Aircraft Seating unwrapped a pre-production model of a new retrofit seat, the PF2000. The sculpted seat, designed to closely mould the human form and optimise knee and leg room, draws on the best of sports car design. Its curved shape gives an impression of greater space in the cabin while the back rest features a modular structure, giving airlines the flexibility for a fully integrated IFE package, an iPad carrier, or simply a high or low literature pocket. 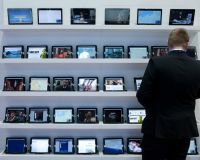 Lufthansa Systems announced that passengers on airlines using its BoardConnect IFE system can now view the latest blockbuster movies. BoardConnect is the first IFE system to have won the approval of leading film studios for their ‘early window content’. Thomas Cook used the first day of the show to announce that it has chosen the Rockwell Collins Paves 3 IFE system, which will be installed in Airbus A320 and A321 which shows that even in the quasi charter part of the market passenger comfort is playing a strong marketing role. 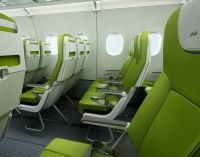 In the same market area Pitch Aircraft Seating, the expanding UK-based aircraft seat manufacturer, unveiled a light-weight economy product intended for the high-density, single-aisle Economy Class retrofit market. The innovative design weighs less than 25kg for a triple unit, thanks to the extensive use of lightweight composite materials. Tapis introduced Ultraleather BOLERO which it believes sets a new standard for sound absorption. The company claims that during independent testing Ultraleather BOLERO outperformed fabrics and genuine leather by improving low and mid-frequency absorption, thereby significantly reducing cabin noise.